Non-Stick finish resists starch build-up and soleplate cleans up easily. Sprays a fine mist to spot dampen wrinkles and correct pressing mistakes. Smart Dial controls temperature, steam activator, and auto cleaning. Sure Steam System automatically delivers the right amount of steam at any temperature setting. Sole Plate Design: 360? Quick? This Black & Decker X750-B5 Steam Iron has an option for a Surge of Steam for your heavier materials and for those hard to get out wrinkles. You also don?t have to worry about whether or not you unplugged your iron, because this one has an automatic shut off. 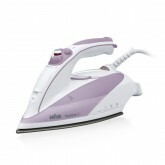 This Phillips GC2910 iron features fast heat-up, variable steam settings and a temperature ready light. The Steam Glide sole-plate offers great scratch resistance, excellent gliding on all fabrics, and is easy to clean. Also, the clever calc clean slider makes it simple to remove scale from your iron, and doing it regularly will maintain the performance and extend your iron?s life. The Black & Decker X1015 delivers 1900 Watts of steam power. With controls for various levels and temperature of steam, you will always get your clothes looking crisp and clean. Its non-stick coated plate and fabric guide keep it and your clothes durable including all your denims thru delicates. This product works only in 220 Volts countries. The Alpina SF-1304 delivers a powerful 2200 Watt steam from its 300ml water tank. The non-stick coated plates, anti-calc and anti-drip functions keep this durable product clean for long lasting use. The SF-1304 has auto shut of and overheat safety protection. This product works only on 220 Volts.